The Bullion Bonanza is a very popular 3 reel, 3 pay-line online progressive slot machine game available exclusively at JackpotJoy. This exciting slot provides players with a chance to win large progressive jackpot. You can bet £1 per line or up to £3 per spin (or US$3). Betting on all lines allows you to win progressive jackpot when 3 Gold bars appear on the third payline. The Bullion Bonanza is a fruit machine with Wild symbol (Gold bar) that gives you a greater chance of completing a winning line. Note that win symbols don't always appear automatically on the pay lines, sometimes they are blank. Definitely, Billion Bonanza is a slot machine that you should give a try if you are a slot fun. However, at the rate of 3 UK Pounds (or even 3 US Dollars) per spin you should set a budget in order to limit your possible loses but still have a chance of winning a big one. 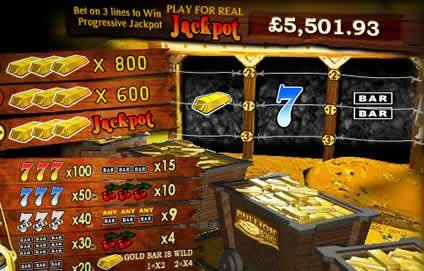 You can play Bullion Bonanza slot exclusively at Jackpot Joy online casino. Play for free or for real and receive 100% match bonus with your first deposit of up to £/$100 plus 10% cash back in case you loose. You can play just for fun and win multiple prizes in daily promotions and giveaways. The largest progressive jackpot of £69,919 was hit on the Bullion Bonanza slot in February 2005 by Caroline H. Check out other Bullion Bonanza jackpot winner stories and testimonials. The winners of the new variation of the popular Jackpotjoy's game, Diamond Bonanza, are also listed there.